For other uses, see Charas (disambiguation). Charas (Hindustani) is the name given to a hashish form of cannabis which is handmade in the Indian subcontinent and Jamaica. It is made from the resin of the cannabis plant (Cannabis sativa or Cannabis indica). The plant grows wild throughout Northern India along the stretch of the Himalayas (its putative origin) and is an important cash crop for the local people. The difference between charas and hashish is that hashish is made from a dead cannabis plant and charas is made from a live one. 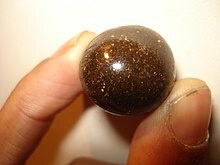 Hashish has been used across the Indian subcontinent for medicinal and religious purposes for thousands of years, and was sold in government shops (along with opium) during the times of the British India and in independent India until the 1980s (marijuana and bhang is still being sold in parts of Rajasthan, India). Charas plays an important and often integral role in the culture and ritual of certain sects of the Hindu religion, especially among the Shaivs — the sub-division of Hinduism holding Lord Shiva to be the supreme god (in contrast to Vaishnavs who believe Lord Vishnu is the supreme god)—and it is venerated by some as being one of the aspects of Lord Shiva. Despite this long history, charas was made illegal in India under pressure from the United States in the 1980s and severe sentences were introduced for cultivation and trafficking of charas. Even the mere possession had a mandatory ten-year prison sentence. These laws have been relaxed, but charas remains a popular medium for police to extort money from consumers of the drug. Even at the peak of the crackdown, charas was still popular and remains so today, especially among young professionals and Indian sadhus. The Naga Sadhus, Aghoris and Tantric Bhairava sects smoke it freely as an integral part of their religious practice. Many smoke it in clay pipes called chillums, using a cotton cloth to cover the smoking end of the chillum and inserting a tightly packed pebble-sized cone of clay as filter under the chunk of charas. Before lighting the chillum they will chant the many names of Shiva in veneration. It is regaining the popularity it once enjoyed with younger generation of India regarding it as a recreational drug of choice. It is freely available in several places around India especially where there is a strong affluence of tourists (Goa, Delhi, Rishikesh, Varanasi, etc.). Although charas can be found in several places around India, its manufacturing can be traced only to specific locations in India such as, Parvati Valley, (Kasol, Rasol, Malana (“Malana cream”), Kashmir as well as several other places in northern India. In southern India there are also several places where charas is manufactured. Charas can be found in many places around India simply because there are people that take charas from the “source” to distribute it in areas where there is a substantial demand of it (usually areas with a lot of foreigners). The nominal price of charas in these areas is substantially higher than in the places where charas is made. There is also a large amount of charas that is illegally exported across to Europe. High quality hashish in India comes from cannabis grown in the mountains. The variety from Himachal Pradesh is considered to be of the highest quality throughout India. It is easily available in Kinnaur, Shimla, Karsog, Kumarsain, Barot,(Kullu–Malana) & Rampur Bushahr; practically every area in Himachal Pradesh. For this reason, the Indian subcontinent has become very popular with backpackers and drug smugglers. During hand-harvesting, live cannabis plants’ flowering buds (as opposed to dried plants/buds) are rubbed between the palms of the harvesters’ hands, and by the end of the day one has perhaps 8 or 9 grams of charas. The faster one works, the lower the quality of charas; hence to make “Malana cream” it is necessary to go very slowly and make only a few grams a day. Nowadays production of cannabis in the Himalayas has increased with growing demand for Malana cream; the ancient art of manufacturing is disappearing under the pressure to capitalize on the domestic and international market for charas. High quality charas was also produced in Nepal and sold in government monopoly stores in Kathmandu until the government gave in to international pressure and got out of the business in the 1970s. Rolpa district in western Nepal was a production center, with ganja and charas both an important cash crop in this extremely isolated, underdeveloped and impoverished region. Charas is smoked, usually mixed with cigarette tobacco and rolled back into the cigarette blank. Rolling paper is also used to smoke charas. Charas with tobacco mixture is filled into the rolling paper to make a joint. ^ “If Drugs Were Legal, Scarlett Might Be Alive”. The Times of India, 14 March 2008.